Hey, we have rooms with a view! Authentic Austrian restaurants are within short walking distance and the 'Wienerwald' is just across the street. Mountain-Bike and Nordic-Walking trails start right from the front door! 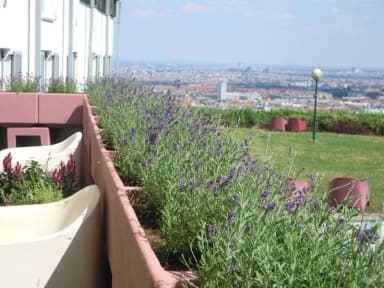 The Palace Hostel Schlossherberge offers an awesome and fantastic view overlooking the city of Vienna. We have 41 rooms each with 4 beds (2 bunkbeds)! All rooms are en-suite (with shower & WC) and equipped with wardrobes & lockers. There is a huge park in front of the house for sunbathing, picnic, relaxing, Yoga, T'ai-chi, ... A chill out room with cable TV, table tennis, tabletop football are at your disposal. We even have our own minigolf court! No curfew owing to key cards. 24h access and check-in (please let us know should you plan to arrive after 22:00!). Free city maps & public transport tickets are available at the reception. Our friendly, international staff with heaps of local knowledge of things to do in Vienna is always happy to help you! The hostel is very well connected to the public transport network. The bus stop 'Wilhelminenberg' can be found right in front of the property entrance. Bus lines 46A or 46B, departing every 8 minutes during the day will let you reach the underground station 'Ottakring'. From here, the underground line U3 takes you straight to 'Stephansplatz' (city centre - total time 25 min), to 'Landstrasse/Wien Mitte' (city air terminal - total time 30 min), to 'Westbahnhof' (western train station - total time 20 min), or to 'Hauptbahnhof' (main train station - total time 40 min). The last bus back to the hostel departs at 00:55 from the underground station 'Ottakring'. In appreciation of our special efforts in operative environment protection we have been awarded with the Tourism-Ecolabel by the city of Vienna.